From Medicom. 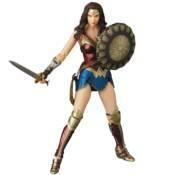 Wonder Woman makes her second appearance in the MAFEX figure lineup from Medicom, this time based on her starring appearance in her very own live-action film! Standing 6' tall, she's fully posable for crime-fighting action, and she comes with an interchangeable head with a snarling expression, several interchangeable hands, her Sword of Athena and two versions of the Lasso of Truth, her intricately designed shield, and a stand. You need this iconic character in your hero collection!